Students at the Oħloq Kulture Showcase earlier today. A number of students aged 8-10 from six different schools on the island showcased their made-up culture earlier today at St Gorg Preca College, Paola Primary School. The showcase was the final phase of Oħloq Kultura, an education project organised by Valletta 2018, in collaboration with More or Less Theatre. 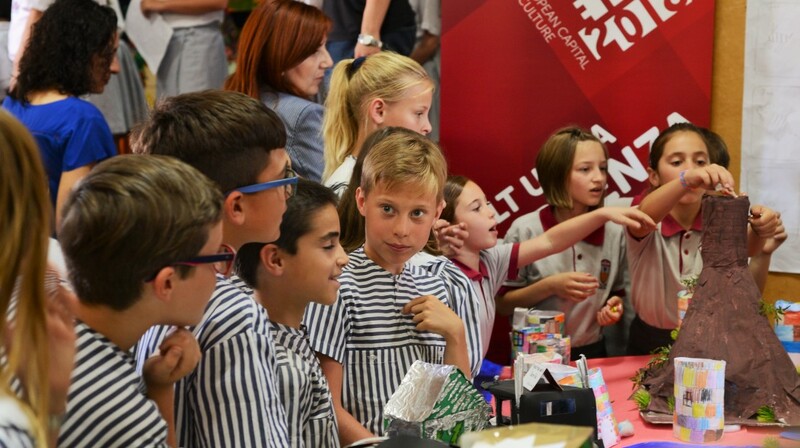 Students from six different schools – Chiswick House School, St Michael’s Foundation, Hamrun Primary, Paola Primary, St Albert the Great and Zabbar Primary are engaged in the project, which raises awareness about Culture Capitals and culture as a whole in a fun, interactive manner. The Minister for Education and Employment Evarist Bartolo praised such initiatives because they don’t only provide a hands-on experience for the students themselves, but also serve as an opportunity to recognize the important role culture has to play in the framing and delivery of our educational system. Participating through their schools, students attend 10 sessions in which they create their own made-up culture, similar in a way how cultures are created in reality. Likening the process to how Valletta was created as a city with its own culture, children learnt about history, architecture and cultural heritage. The students devised their own cultural programme for their made up town, which helped them better understand the work being done by such entities as Valletta 2018 Foundation. Students from paired schools also had Skype calls with each other in which they spoke about their town and its culture, allowing for cultural exchange and a way to build relationships. The children presented their cultural calendar earlier today during the showcase event. Thanks to a collaboration between Festivals Malta and the Valletta 2018 Foundation, an Oħloq Kultura children’s area is being set up during Għanafest next month.